With CoolSculpting in DC, Dr. Isaac reduces stomach fat in a female patient. This patient had a treatment of Exilis Ultra 360 on her upper and lower eyelids to tighten and smooth the skin around her eyes. This 70-year-old female patient was seeking to tighten the appearance of the skin on her upper arms. 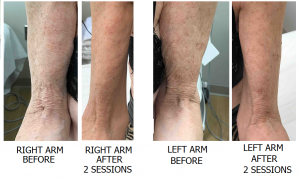 With 2 monthly treatments with Exilis Ultra 360, her arms look much more toned and firm!